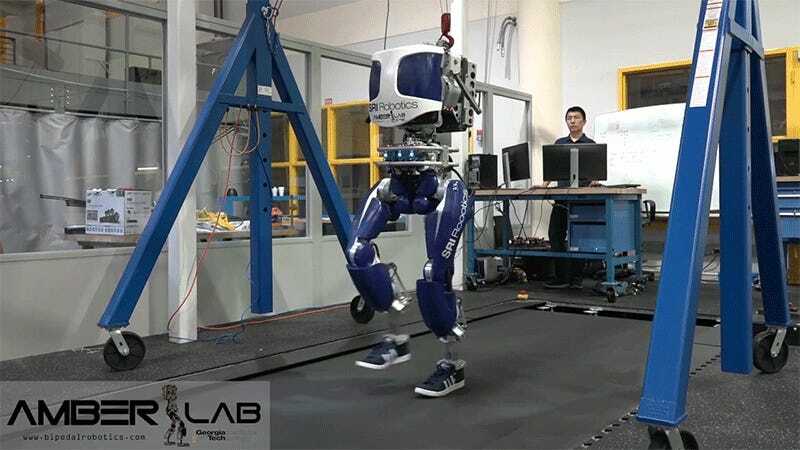 All the sensors, servos, and motors that allow humanoid robots like ATLAS to walk on two feet require a lot of battery power—so much so that they’re still impractical for real-world applications. But by more closely replicating a human’s gait—at least one with lots of swagger—Georgia Tech’s DURUS requires far less power. DURUS isn’t quite as sure-footed as an adult who has been walking since they were an infant, but unlike robots like ATLAS which have to hunch down low to keep their balance while walking on flat feet, Georgia Tech’s humanoid walks by first landing on its heels with every step, and then transitioning to toe push-offs to start the next. That’s why its gait seems more natural to us, and considerably more confident than the walking style of other bots. There’s a lot of software at work to keep DURUS balanced as it walks. The robot requires constant adjustments and subtle tweaks to the position of its upper body to help lift its legs and land the next step. There’s unique hardware at play too, including strong ankle springs that store and release energy every time a foot makes makes contact with the ground. DURUS’ feet also look and behave more like a human’s do, which means the robot can wear fancy sneakers. It might not be ideal for the battlefield just yet, but DURUS seems like it’s more than capable of standing in line for hours the next time a rare pair of Nikes goes on sale.